An illuminating in-depth study of one of the most well-known and recited of all the Buddhist texts--by the renowned modern translator. The Prajna Paramita Hridaya Sutra is among the best known of all the Buddhist scriptures. Chanted daily by many Zen practitioners, it is also studied extensively in the Tibetan tradition, and it has been regarded with interest more recently in the West in various fields of study—from philosophy to quantum physics. In just a few lines, it expresses the truth of impermanence and the release of suffering that results from the understanding of that truth with a breathtaking economy of language. Kazuaki Tanahashi’s guide to the Heart Sutra is the result of a life spent working with it and living it. He outlines the history and meaning of the text and then analyzes it line by line in its various forms (Sanskrit, Chinese, Japanese, Korean, Tibetan, Mongolian, and various key English translations), providing a deeper understanding of the history and etymology of the elusive words than is generally available to the nonspecialist—yet with a clear emphasis on the relevance of the text to practice. 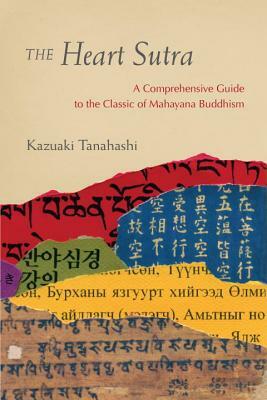 This book includes a fresh and meticulous new translation of the text by the author and Roshi Joan Halifax. KAZUAKI TANAHASHI is the author, translator, and editor of numerous books, including Brush Mind; Sky Above, Great Wind; and several collections of the works of Eihei Dogen, including the monumental Treasury of the True Dharma Eye: Zen Master Dogen’s Shobo Genzo. He is also a renowned calligraphic artist and teacher whose works have been exhibited throughout the world. He lives in Berkeley, California.